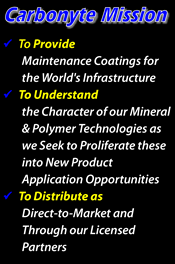 "Advancements in polymer chemistry have produced the first 'Single Package' slurry that out performs other surface treatments currently available and provides the best option to expensive paving alternatives." The above example of an aged and deteriorated parking lot was able to save over $6,500 by using Carbonyte System, Inc's Comprehensive Pavement Restoration system. Does your pavement experience any or all of these issues? CarbonSeal-FR applied on Tarmac at Hickam AFB, Honolulu, HI using a sealcoat buggy with spraybar. 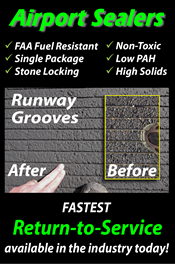 CarbonSeal-FR: Fuel Resistant Airport sealer used on San Francisco International Tarmac. Two coats, spray & squeegee applied. CarbonPlex H-25 Fog Sealer spray application at John Wayne Airport's main runway. Night cure and runway open before 6am. CarbonSeal-FR Fuel Resistant sealcoat spray applied on FBO Tarmac. CarbonSeal-FR spray application sealcoat on tarmac.